Two buildings at 116th Street and Park Avenue — right next to the Metro-North tracks — have collapsed after an explosion and fire at that started at around 9:30 a.m. The FDNY says that 250 firefighters responded to the five-alarm fire at the scene, which was visible from midtown. At least 69 people have been injured, and three have died, according to city officials. More than a dozen are still missing, the AP reports. “We do know there is a certain number of people we are trying to locate,” Mayor de Blasio said in a press conference. He added that it “will take quite a bit of time” to sort through the rubble. The four- and five-story buildings contained 15 apartments between them. De Blasio and fire commissioner Sal Cassano confirmed that the explosion was caused by a gas leak. “This is a tragedy of the worst kind because there was no indication in time to save people,” de Blasio said. A Con Ed spokesman told WNBC-TV that they were responding to a call about the strong smell of gas just before the explosion occured. Con Ed workers arrived on the scene a few minutes after the blast, and the FDNY got there two minutes later. 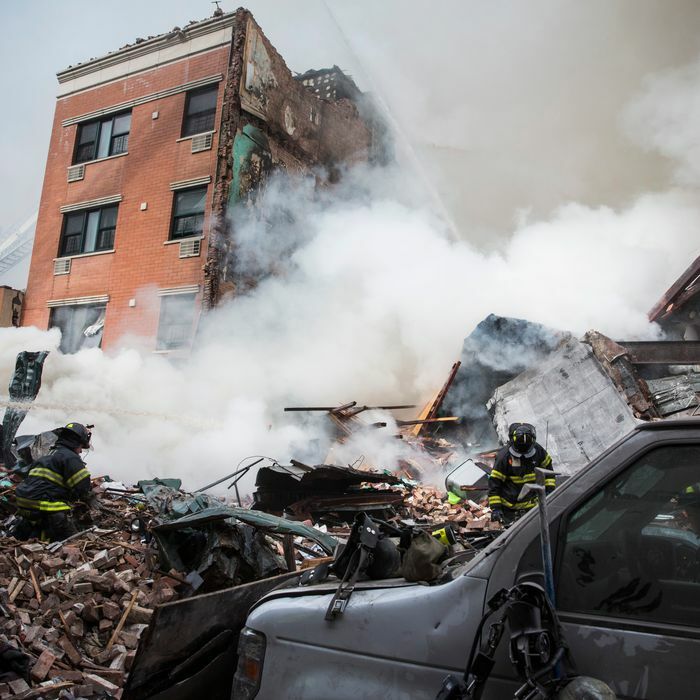 “For weeks we’ve been smelling gas,” 21-year-old Ashley Rivera told the New York Daily News. Cassano also said that the air quality in the area is not dangerously bad, except for immediately around the building. Both the Times and the Daily News report that Buildings Department records show that, in 2008, one of the buildings, 1646 Park Avenue, was found to have “several vertical cracks which is hazardous for the safety of the structure.” The problem does not seem to have been fixed. In January, residents of the building complained about cracks in their apartment’s ceiling and walls, which could indicate that the building was unstable. Meanwhile, the Daily News reports that a new gas pipe was supposed to be installed in the other building, 1644 Park Avenue, last June. It’s not clear if that job was ever completed. Most troubling: During the press conference, de Blasio said that one of the buildings did not have a certificate of occupancy, which means people should not have been living there.